These are so easy to make that the kids can help me prepare them. It is just as easy to make a wide variety of these fancy morsels which allows you to set forth an impressive candy tray. Also makes an excellent gift. I prefer to work in small batches but the recipe can certainly be doubled or tripled. 1. 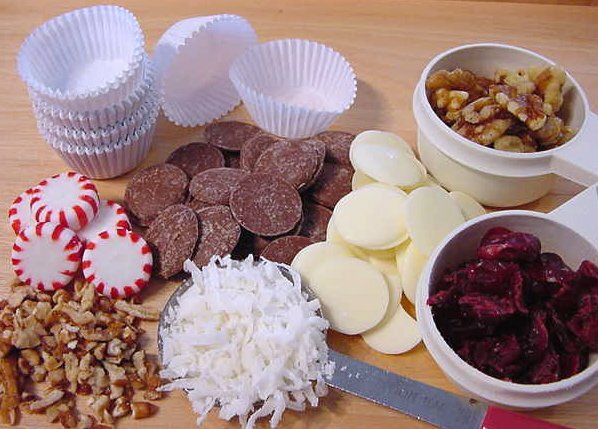 Place the chocolate wafers in a microwave safe dish. 2. Heat for 1 minute and stir. 3. If needed, heat in 15 second intervals, stirring after each, until melted and smooth. 4. Stir in one or two of the filling ingredients listed. 5. The amount and combinations depends on personal taste but don’t add so much that the mixture doesn’t hold together. 6. Spoon mixture into mini candy papers. 7. 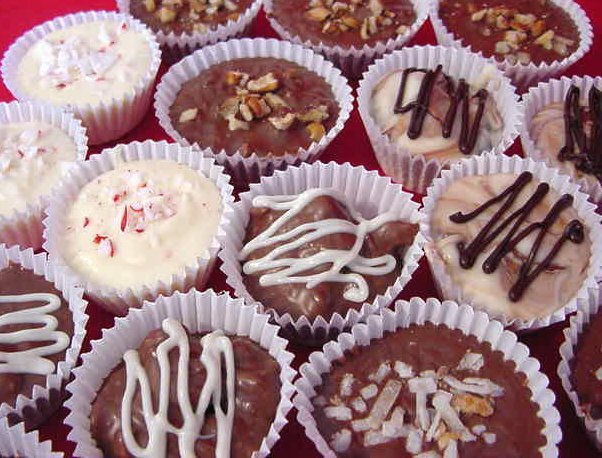 Garnish with more the the Filling Ingredient(s) used or drizzle, in a contrasting chocolate, in a zig-zag pattern on top. 8. TIPS: do not allow moisture to come in contact with the chocolate while it is melting or it will “bind” and become an unusable mess. 9. Make sure your bowl and spoons are completely dry.